There are many canyons in Utah and each of them has its own beauty to share. But as I found out, it was Bryce Canyon that got my heart racing and will stay in my memory for ever. Have you photographed Bryce? Have you been there? I have always wondered what it would be like to experience the vast American expanses first-hand, to stand by the rim of Grand Canyon or Bryce Canyon and to admire the monumental view. What would it be like to photograph it? Would I be able to do it justice? Would I prefer such a view to the usually much smaller Scottish glen, for example? For many years I have admired other photographers’ images of the stunning Utah National Parks and vowed that someday I would capture this beautiful area for myself. Eventually, I and three friends stepped off a plane onto US soil and spent an incredible two weeks exploring and photographing various National Parks, as well as having a brief but very enjoyable time in Arizona. The sheer beauty of these places is overwhelming and the scale of the landscape has to be seen to be believed. 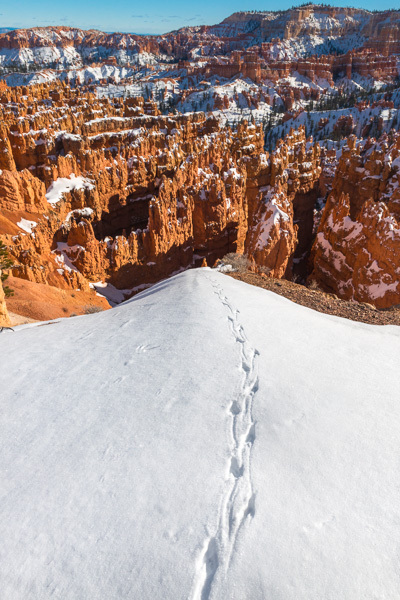 Looking at Bryce Canyon from the rim is something that everyone – not just photographers – should experience. Having spent a couple of nights at Zion National Park, we made our way towards Bryce and its world famous canyon. Still recovering from jet lag, we had enough courage and energy to stop at various locations en route to photograph the ever-growing spectacular nature Utah has to offer. We even managed to squeeze out some time for the so-called Red Canyon at Dixie National Forest, just 25 minutes before Bryce. I absolutely loved this little area – little in comparison with the grandeur of Bryce Canyon. However, due to schedule restrictions, we didn’t spend as much time there as we should have and I feel that I haven’t done it justice. I will be visiting the location again in the future, that’s for sure. I had heard in the past that the place is heaving with tourists but nothing prepared me for what I was about to witness. The busiest place I have ever seen in my life next to Bryce Canyon is Venice, with Santorini in second place. Surely, if we visit the canyon during the early morning hours we should be fine. True enough, but the midday visits were slightly frustrating, and with people all over the place, composition was fast becoming mission impossible. We stayed at Bryce Canyon for three nights, photographing it for more than two full days. During that time we had sunshine, rain, storms, and even snow on the last morning. I suppose this kind of weather should be expected, considering that its elevation is between 8000 and 9000 feet. The highest mountain in the UK is Ben Nevis, and it is just over 4500 feet. I expected to get tired during the trail walks due to the elevation, but I didn’t notice it much. After breakfast that morning we decided to head back out and spend some time around the Queen’s Garden Trail. As all four of us photograph at a different pace, with myself being always the slowest and the one that goes not too far, we agreed on meeting at a certain time by the carpark. I remember looking at the sky on the south side of the canyon and thinking that I might be lucky enough to miss the storm, if only I would hurry up and rush to the car. 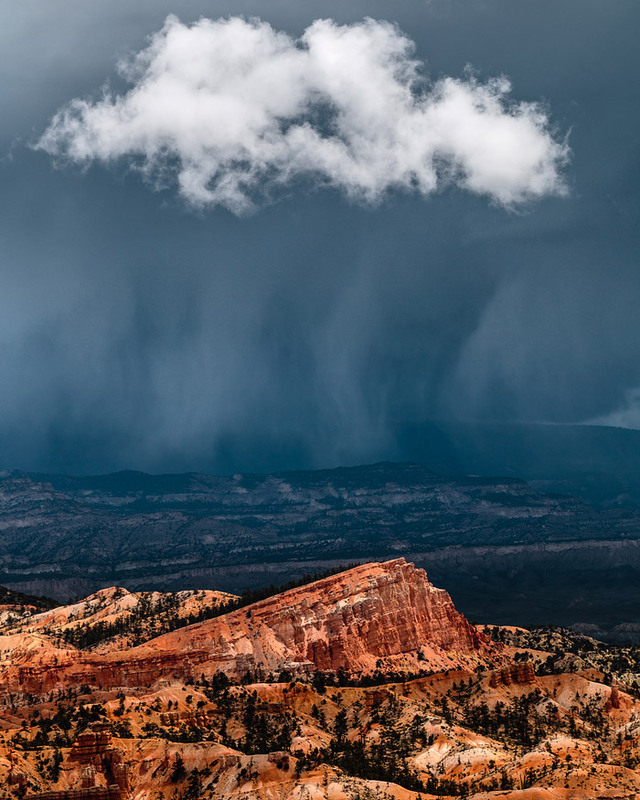 Admittedly, although we were faced with many such storms, very few managed to pour down where we were photographing, and most ended up further in the canyon. This specific one seemed a little strange. Although the heavy clouds were higher up in the atmosphere, there seemed to be smaller, fluffy clouds scattered around at lower altitude. It was the combination of the heavy cloud and the downpour and that one, smaller, fluffier cloud full of character that caught my attention. I must admit that if such an event had happened to me a couple of decades ago, I wouldn’t have even paid any attention to it. 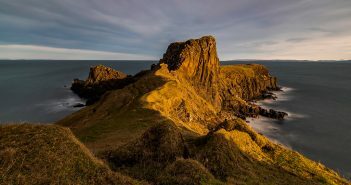 Landscape photography is definitely to blame for creating a monster such as myself – one that thrives on catching such freakish events on camera. I love the Colorado Plateau and Bryce most of all. Thanks for the beautiful image and reminding me of its beauty. I was there in January to photograph the red rock in snow which has been on my ‘to do’ list for a few years. Excellent use of the footprints on the snow, Joseph, they take the viewer straight into the scene. Peter, I recognize that view. 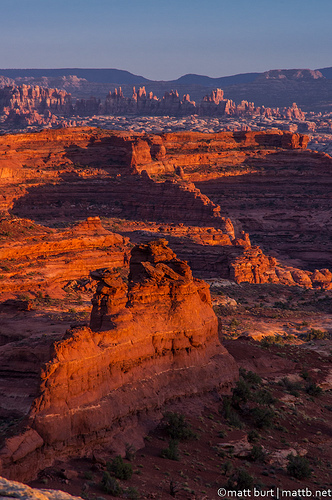 Is that from Murphy’s Hogback at Dead Horse Point? I’ve ridden my bike on the White Rim Trail that follows that white canyon rim for 100+ miles. Fantastic country there. A magical place and you made a very nice capture of it. Although I do believe that you have an amazing countryside all around you, at some point you need to visit Bryce Canyon, it’s simply breathtaking. Thank you very much for leaving a comment. By looking at your picture, I can see that you were as lucky as I was that day. Loads of mood and a great atmosphere, mixed in with a stunning location, can and do indeed create superb looking images. 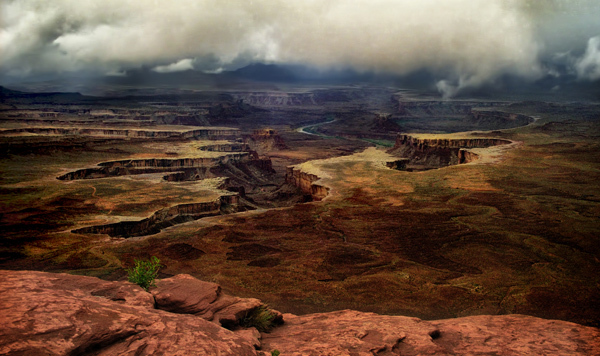 I had the storm at Canyonlands as you can see. I’d love to hear your comments about that image Dimitri.